Wilma “June” Smart, 85, a resident of Goreville, Illinois and a former resident of Stonefort, Illinois, passed away Thursday evening, October 17, 2013 at 10:23 p.m. at the Heartland Regional Medical Center in Marion, Illinois. June was born October 27, 1927 in rural Tunnel Hill, Illinois. She was the daughter of Ralph & Edith Faye (Leonard) Brooks. June was united in marriage to Henry Clayborn Smart. He preceded her in death on September 13, 1983. Survivors include her children, Danny Lynn & Lenore Smart of Elgin, IL, Terry Ray Smart of Elgin, IL, Cynthia Faye & Robert Haggard of Atchison, KS and Marianne & Barry Wilson of French Lick, IN; two grandsons, Justin Ralph Smart, Kevin Laurence & Sarah Smart, a great grandson, Justin Joseph “J.J.” Smart; a sister, Vicky Baker Burns of Alvaton, KY; and a former daughter-in-law, Chris Smart of Elk Grove Village, IL. In addition to her parents and husband, June was preceded in death by a son, Scotty Smart, two brothers, Arnold and Lowell Brooks, a sister, Faye Junas and an infant sister, Evelyn Brooks. June was a graduate of the Vienna High School. She was a homemaker and enjoyed square dancing, shopping, and spending time visiting with family and friends. June is remembered for always being nice to everyone she came into contact with. She was of the Baptist faith. 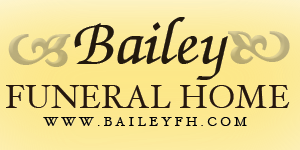 Funeral services will be held Monday, October 21, 2013, at 1 PM at Bailey Funeral Home in Vienna. Pastor Todd Greiner will officiate. Burial will be in the Taylor Cemetery, north of Vienna. Visitation will be from 11 a.m. – 1 p.m. Monday at Bailey Funeral Home in Vienna. Memorials may be made to the Huntington’s Disease Society of America, 505 8th Ave, New York, New York 10018.